Like so many others, I remember going out into the backyard with my grandmother to feed the birds. She would take table scraps and day old bread and cast it around the base of the birdbath, and then we would sit on the back steps and watch as the birds gathered around to dine. She could name off every species of bird that came into the yard. When she went to the grocery store she would buy an extra loaf of bread, just for feeding the birds. Some days we would go to the city park and feed the ducks and geese and she would always take along a bag of crumbled white bread for me to through out to them. She loved her birds and never knew that her acts of kindness was harming, if not killing them. As it turns out, bread is bad for birds and has little to no nutritional value. It’s an easy meal and when birds become accustom to being fed bread they don’t learn to forage for natural foods. This has several bad side effects that create real problems for birds and waterfowl in particular. The first is portion control. Ducks and geese will eat as long as someone feeds them. You offer up a couple slices of bread and then your neighbor puts out a pan of bread. Then the couple across the cove sends out their grandchildren to feed the birds. Now these birds are full and don’t want to eat the nutritional food they need to survive. If this pattern repeats for a long period of time it can actually lead to the birds being over weight, malnourished and can lead to death. 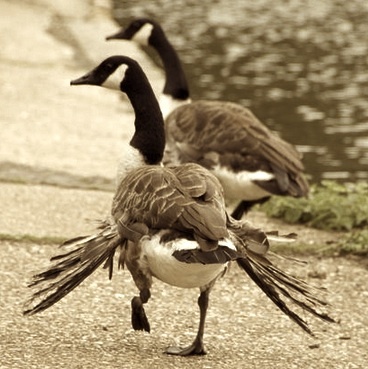 A high carbohydrate-based or unhealthy-high protein diet can cause a condition in geese, ducks and swans called “angle wing”. This deformity occurs when the last joint of the wings permanently twists outward and prevents the bird from flight. As winter approaches these birds are unable to migrate and can freeze to death. Birds that can’t fly are also more susceptible to predators. There is another condition that an improper diet can cause in birds, all birds, called metabolic bone disease or MBD. This can occur in birds at any stage of life, but is especially frequent in young birds. MBD is like savior osteoporosis in humans. It causes extreme pain and a deforming of the bird’s entire skeletal system. Birds with MBD will often suffer from multiple bone breaks and fractures. Another problem that occurs when feeding large groups of waterfowl is that they defecate in the same place that they feed. This can lead to the transmission of diseases from one bird to another. When birds feed naturally, they are less likely to forage in large groups and in areas of heavy deposits of excrement. This is not to say that you should never feed the bird and waterfowl. Occasional feeding is a great way to enjoy these beautiful animals. Just remember portion control and don’t feed at the same location all the time. Don’t ever feed them bread, popcorn, crackers, cat food or dog food. Feed them healthy foods, such as cracked corn, wheat, barley or similar grains and oats. Duck pellets or birdseed of any type or mix is a good choice. You can also give them grapes that are cut in half or even fresh diced vegetables or defrosted frozen peas or corn. These are all good options, readily available and will keep the birds healthy and happy.